I try to have lunch with my Mum once a week. Neither of us are very decisive, so we always end up going to the same cafes and ordering the same thing. Not any more! We’ve promised to be a little more adventurous and try out some new places, which I plan on sharing with you guys! If there’s somewhere you think we should try, please comment below and we’ll add it to our list. 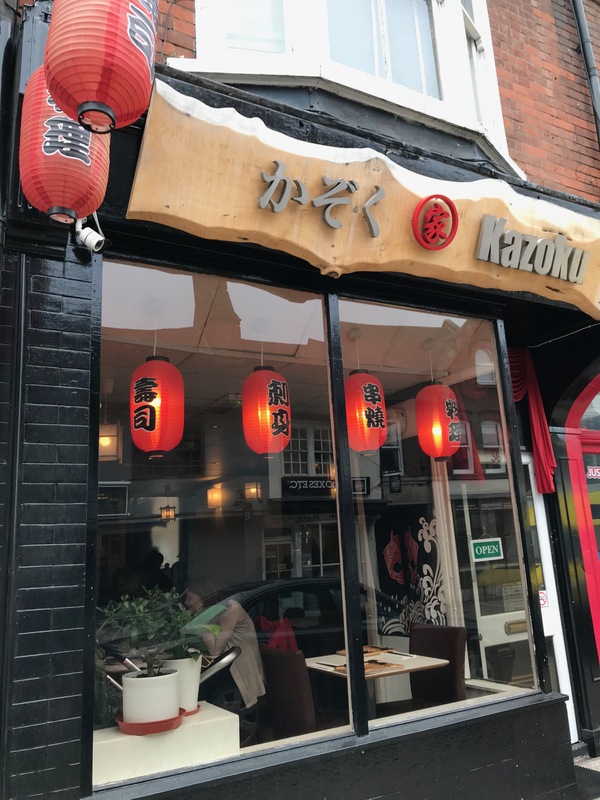 Last week, we reserved a table at Kazoku in Hitchin. It reviews amazingly well on TripAdvisor and Facebook, so I thought it was worth a shot. Kazoku is a very small, unassuming Japanese restaurant on Bancroft. Blink and you’ll miss it! There are only about 8-10 tables, so if you fancy going, I would definitely recommend booking ahead. They do also offer takeaway. The decor is very traditional, with beautiful lanterns hanging in the windows. There is also a hypnotic water window and quirky Japanese touches dotted about. For drinks, we chose fresh juices which are served in trendy jars. There are lots of combinations to choose from – apple, avocado and kiwi, and honeydew, cucumber and lime are just a couple of examples. They’re quite expensive at £4.20 each, but they are really fresh and delicious and you feel very healthy after drinking them. They do serve alcohol as well – Sake, wine and beer are all available. I don’t know much about Japanese food although I do know it’s very healthy. We eat a lot of Chinese and Thai food, but I’ve only had Japanese a couple of times before. The menu here is extensive. You can choose from tempura, rice rolls, sashimi, Katsu, Teriyaki, Donburi, noodles and the list goes on! I’d read good reviews of their Bento boxes, so we both ordered the salmon Teriyaki Bento box. This came with salmon Teriyaki, prawn Katsu, chicken dumpling, prawn and pork dumpling, salad, rice, pickles and miso soup. I think this is pretty good value for just under £11. All tables receive a seaweed starter. This was really good and comes with extra soy sauce should you need it. Service was efficient and we received our food quickly after finishing the starter. The Bento boxes are big and are certainly plenty for lunch. What I love about Bento boxes is the fact that you get lots of different things to try. And it was delicious! The salmon was cooked perfectly and it’s a good-sized portion. The dumplings were tasty and the salad was fresh. I barely needed the Miso soup as I was pretty full but I managed most of it at the end. My Mum always says things like, “Oh, I don’t need very much for lunch,” and ends up ordering a toasted teacake, but even she practically wolfed this down and exclaimed how delicious it was. She’s already planning to take my Dad there to try it. I had a chat with one of the part-owners (sorry I didn’t get the name!) and he said Kazoku is a family-run business, with everyone contributing in some way, from the cooking to the running of the restaurant. How apt that ‘Kazoku’ in Japanese means ‘family’. They opened the restaurant last summer and, looking at all the raving reviews so far, it has been a huge success. I will definitely be returning, and I’m looking forward to trying the rest of the menu. We love to support local, independent businesses, and this is a real gem. Have you been to Kazoku? Please let us know what you thought in the comments below. For more information on Kazoku, please visit their Facebook page. Don’t worry Paul, we will definitely return and make our way through the rest of the menu! What’s your favourite dish to order here?